To describe 2-year results of deep intrastromal arcuate keratotomy with in situ keratomileusis (DIAKIK) for the treatment of high astigmatism after keratoplasty. This prospective study included 20 eyes from 20 patients presenting with high astigmatism after keratoplasty. All were treated by two-step femtosecond laser surgery, with two intrastromal arcuate keratotomies and a corneal flap, followed a few months later by excimer photoablation after reopening of the flap. 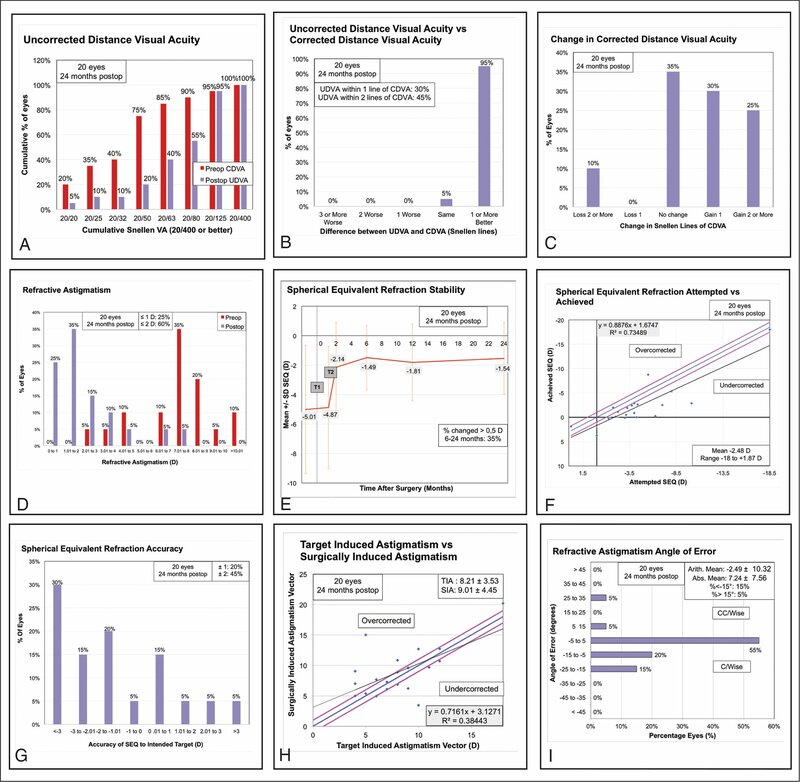 At 24 months, both uncorrected (UDVA) and corrected (CDVA) distance visual acuity had improved from 1.12 ± 0.42 logMAR (20/200 Snellen) before surgery to 0.58 ± 0.23 logMAR (20/80 Snellen) (P < .001) and from 0.31 ± 0.26 logMAR (20/40 Snellen) to 0.20 ± 0.20 logMAR (20/32 Snellen) (P = .04), respectively. The mean spherical equivalent improved from −5.01 ± 4.35 to −1.54 ± 2.42 diopters. The mean efficacy index was 0.63. The mean correction index was 0.93 ± 0.32. The mean flattening index was 1.09 ± 0.75 and the mean safety index was 1.39. No graft rejection or epithelial ingrowth was observed. This two-step procedure was an effective treatment for high astigmatism after keratoplasty. The use of both femtosecond and excimer lasers helped to avoid some complications that would have jeopardized the grafts. Refractive and topographic stability was good 2 years after surgery. The correction of high astigmatism after keratoplasty remains challenging. High astigmatism is the main factor limiting visual recovery in patients with a clear graft. In addition to optical corrections1 and selective suture removal,2 several surgical techniques for reducing this astigmatism have been explored, with a view to improving the vision of patients with irregular corneas: wedge resection,3 compression sutures,4 and incisional keratotomies, alone or combined with compression sutures, manually or with femtosecond laser assistance.5–13 However, the development of femtosecond lasers has increased the precision of keratotomy, making it possible to perform intrastromal keratotomy,12 thereby decreasing the risks associated with conventional keratotomy, such as infection or corneal perforation. Laser in situ keratomileusis (LASIK) surgery can also be used to reduce corneal astigmatism and ametropia. The creation of a flap per se can modify astigmatism by up to 4.00 diopters.14 For this reason, two-step LASIK surgery is already used by some authors.15 However, this technique is limited by the large amount of corneal tissue consumed and the difficulty correcting high degrees of irregular astigmatism. The combination of arcuate keratotomy and LASIK has already been described.16,17 We present the results obtained 2 years after the use of a surgical technique called deep intrastromal arcuate keratotomy with in situ keratomileusis (DIAKIK) for the treatment of high astigmatism after keratoplasty (penetrating or deep anterior lamellar keratoplasty) for 20 eyes. This prospective non-randomized clinical study was performed at the Quinze-Vingts National Ophthalmology Hospital in Paris, France. Informed consent was obtained from each patient before inclusion in the study, in accordance with the tenets of the Declaration of Helsinki, and the study was approved by the Ethics Committee of the French Society of Ophthalmology (Institutional Review Board 00008855). We studied eyes presenting with high astigmatism and ametropia that could not be corrected by conventional LASIK after keratoplasty. 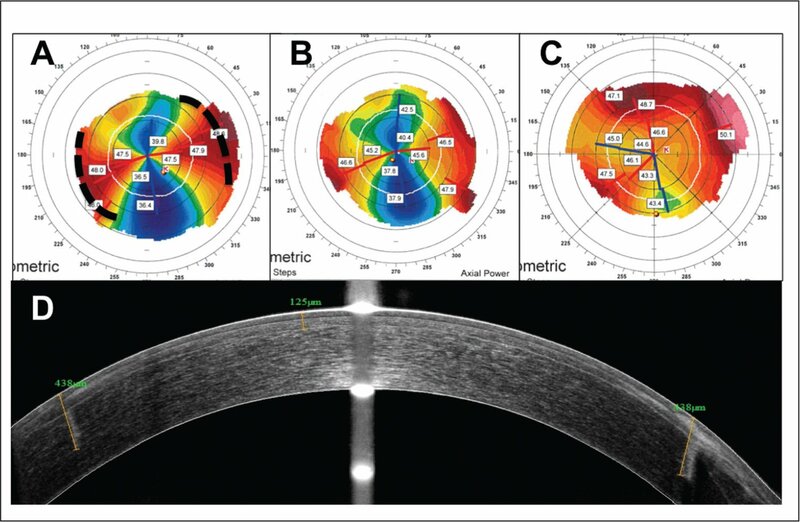 Patients were included if they had undergone a standard examination between January 2013 and April 2016 that included visual acuity measurement with and without correction (using spectacles), slit-lamp examination, Fourier domain optical coherence tomography (OCT) (RTVue; Optovue, Inc., Fremont, CA), and corneal topography (Orbscan II; Bausch & Lomb, Rochester, NY), and had their sutures removed more than 12 months before. All patients had undergone 8.25-mm diameter keratoplasty. The cornea was mapped with the Fourier domain OCT system and a corneal adaptor module. The corneal adaptor module software (version 5.5) automatically processed the OCT scan for pachymetry, to determine corneal thickness. The exclusion criteria were a non-translucent graft, a history of graft rejection, and concomitant cataracts. In this consecutive series, all patients undergoing surgery by this technique were followed up for 2 years. Without releasing suction ring pressure, we then switched the laser to LASIK settings. An anterior corneal flap with a depth of 130 µm and a diameter of 9.5 mm was created. The flap was lifted with a manipulator to expose the arcuate keratotomies. The arcuate incisions were then rinsed with a balanced salt solution (BSS; Alcon Laboratories, Inc., Fort Worth, TX), and the flap was replaced. Standard treatment with topical dexamethasone (Tobradex; Alcon Laboratories, Inc.) and fluoroquino-lone (Exocine 0.3%; Allergan, Courbevoie, France) for 8 days and lubricants for 1 month was prescribed. All patients underwent the same standard examination, as described above, 1 day, 1 week, and 1 month after the first surgical step. Approximately 1 month after the first intervention, the second step (T2) was performed to treat residual ametropia and astigmatism. A minimum interval of 1 month was required for the initial reestablishment of sufficient refractive and topographic stability for T2 to be performed. The same topical anesthesia and disinfection procedure was used. The flap was relifted and folded back with great care. Excimer laser surface treatment (WaveLight EX500, Allegretto Wave Excimer Laser System, Alcon Laboratories, Inc., Fort Worth, TX) was then performed on the stroma, over a diameter of 6 to 6.75 mm. We used the same photoablation settings and nomogram as for regular LASIK. The flap was then replaced, and the same postoperative treatment as after the first intervention was prescribed. In both steps, the targeted refraction was zero. Postoperative check-up visits were planned for 1 day, 1 week, and 1, 3, 6, 12, and 24 months after this second intervention. All 20 eyes underwent both surgical steps and were followed up for 2 years. Astigmatism was analyzed by the Alpins method.19,20 We determined the surgically induced astigmatism (SIA) vector, the target induced astigmatism (TIA) vector, the correction index (ratio of the SIA to the TIA), the flattening index (ratio of the flattening effect – SIA multiplied by the cosine of twice the angle of error to the TIA), and the refractive astigmatism angle of error. Efficacy was assessed by dividing the mean postoperative uncorrected distance visual acuity (UDVA) by the mean preoperative corrected distance visual acuity (CDVA). Safety was assessed by dividing the mean postoperative CVDA by the mean preoperative CDVA. The results are presented as means and standard deviations for continuous variables and as proportions for discrete variables. We used the d'Agostino-Pearson test to assess the normality of our data distribution, and we then applied non-parametric statistics. The Wilcoxon matched-pairs test was used for the statistical evaluation of comparisons between preoperative and postoperative continuous data. The Mann–Whitney U test was used to compare continuous data, as appropriate. Spearman's rank correlation tests were used to explore the relationships between values. For binary outcomes, we used the stratified Cochran chi-squared test for intergroup comparisons of proportions. The Snellen CDVA was converted to logMAR units for analysis. Corrected P values of less than .05 were considered to be statistically significant. Statistical analysis was performed with SPSS for Windows software (version 20.0; SPSS, Inc., Chicago, IL). The technique was performed on 20 eyes (20 patients; 12 men and 8 women, aged 34 to 82 years) presenting with high astigmatism after keratoplasty (14 penetrating keratoplasties, 6 deep anterior lamellar keratoplasties). The demographic data for the patients at inclusion are summarized in Table 1. All patients underwent both surgical steps. 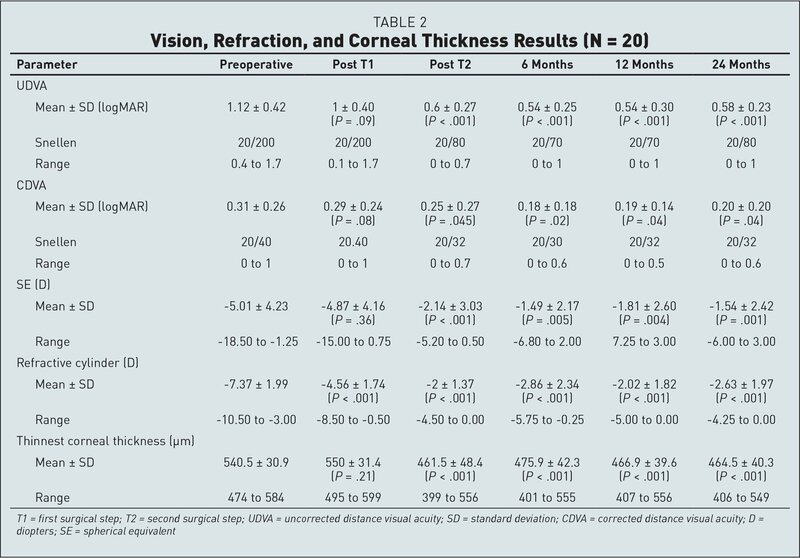 The main results for vision are summarized in Table 2. UDVA improved, although not significantly, after T1 (P = .09). However, it improved significantly between the preoperative determination and T2 (P < .001) and this improvement persisted 6 (P < .001) and 24 (P < .001) months after surgery. CDVA also improved, initially non-significantly after T1 (P = .08) and then significantly (P = .045 after T2, P = .02 at 6 months, and P = .04 at 24 months) (Figure 1). CDVA worsened from preoperatively to 24 months postoperatively for 2 eyes (Figure 1): 0.3 (20/40 Snellen) to 0.5 (20/63 Snellen) logMAR, and 0 (20/20 Snellen) to 0.1 (20/25 Snellen) logMAR for the second. However, for these 2 eyes, CDVA 6 months after surgery was similar to that before surgery. The mean efficacy index was 0.76 at 6 months after surgery and 0.63 at 24 months after surgery. The safety index was 1.46 at 6 months after surgery and 1.39 at 24 months after surgery. The mean spherical equivalent was slightly lower after T1 (P = .36), but then became significantly lower after T2 (P < .001) and was significantly lower at 6 (P = .005) and 24 (P = .001) months after surgery than before surgery. The mean refractive cylinder was also significantly lower after T1 (P < .001) and this decrease persisted after T2 and at 6 (P < .001) and 24 (P < .001) months after surgery. The changes in refractive astigmatism are reported in Figure 1. Spherical equivalent remained highly stable throughout the follow-up, as shown in Figure 1. Some patients had a high spherical equivalent (up to −18.50 D) that decreased considerably after T2 thanks to the arcuate incisions, reducing both the sphere (up to −15.00 D) and the cylinder (Figure 1). Table 3 shows the topographic cylinder results for each patient. As for the refractive cylinders, the topographic cylinders decreased significantly from T1 to 24 months postoperatively (9.09 ± 3.50 D to 3.52 ± 1.63 D; P < .001). The mean correction index was 0.96 ± 0.31 at 6 months after surgery and 0.93 ± 0.32 at 24 months after surgery (Figure 1). The mean flattening index was 0.90 ± 0.29 at 6 months after surgery and 1.09 ± 0.75 at 24 months after surgery. The angle of error was accurate (between −15° and +15° for 80% of eyes), as shown in Figure 1. Two eyes (10%) had an incomplete flap due to the fibrosis ring of the graft. The flap had to be completed manually with a crescent. One flap (5%) required suturing with two stitches on the day after T1 because it was folded under the therapeutic lens, which was removed 1 month later. We observed no epithelial ingrowth or graft rejection in our study. Moreover, no flap ever separated from the old transplant wound during lifting. 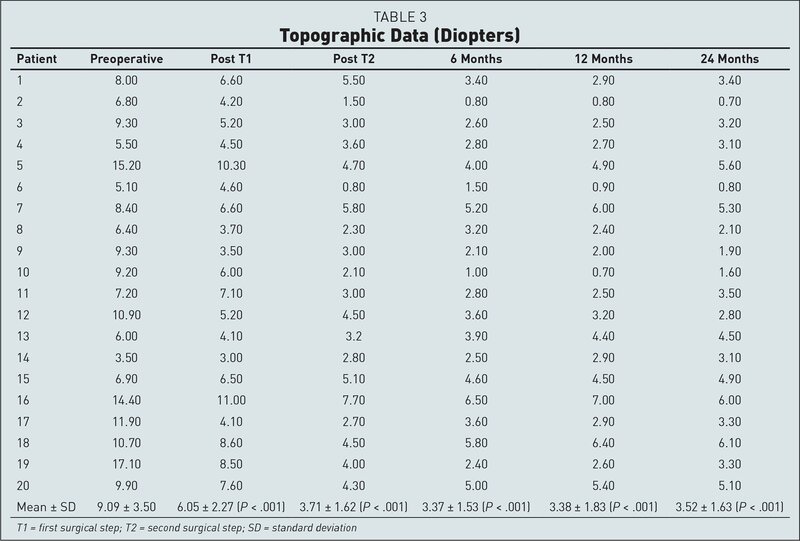 We compared tissue sparing between DIAKIK and simulated LASIK for these 20 eyes (Table 3). The results for simulated LASIK were obtained with Allegreto WaveLight software. DIAKIK resulted in less photoablation (P = .01) and a wider posterior wall (P = .03) than LASIK. Figure 2 illustrates a representative case with its main technical parameters. Representative results for a patient treated by deep intrastromal arcuate keratotomy with in situ keratomileusis. (A) Preoperative Orbscan (Bausch & Lomb, Rochester, NY) with two arcuate keratotomies drawn, (B) after phase 1 and (C) after phase 2. (D) Corneal anterior segment optical coherence tomography, sagittal view, with visualization of the arcuate keratotomies, and the corneal flap marked at 125 µm on this image. In this example, the two arcuate keratotomies were at 15° and 195°, with a length of 80° from 130 to 440 µm, and an optical zone of 6 mm. The flap was at 130 µm, on a cornea that was initially 550 µm thick at its thinnest point. The correction of high astigmatism is a major factor in the recovery of vision after keratoplasty. We found that DIAKIK is a good tool for this correction, yielding stable results over time. Our results for visual acuity were similar to those obtained in other studies16,17,21,22 and the difference detected was statistically significant for both UDVA and CDVA. Our results for spherical equivalent and refractive cylinder correction followed the same trend as the results reported for similar techniques,16,22 with a significant, large decrease immediately after T2 and throughout follow-up. Likewise, we also obtained satisfactory results for vectorial analysis (correction and flattening indices) with the Alpins method.21 The overall safety index of 1.39 at 24 months was consistent with published results.16 Two patients had a lower CDVA at 24 months than before surgery, but their CDVA at 6 months was similar to that before surgery and they both developed a cataract afterward. The main complication observed was an incomplete flap that had to be completed manually in 2 of the eyes studied. One of these patients displayed improvements in both UDVA and CDVA. The other displayed an improvement in UDVA and CDVA that remained stable until 6 months after surgery, decreasing thereafter due to cataract development, as explained above. The initial depth of the flap was 110 µm, but we rapidly discovered that the fibrosis ring that formed after keratoplasty made it impossible to achieve a full flap in some cases. We therefore generated flaps at a depth of 130 µm to avoid the fibrosis ring and the need to complete the flap manually. Shalash et al.22 used flaps of the same size. Although the keratoplasties had a smaller diameter than the flaps used for DIAKIK, we observed no separation of the flap from the old transplant wound. Contrary to previous reports,17,22 none of our patients displayed epithelial ingrowth despite the lack of identification of preventive or risk factors. Even with the complications observed in some of our patients, we were able to achieve a correction index of 0.93 ± 0.32 at 24 months. Refractive surgery is, in itself, a perfectly good option for treating astigmatism. However, consistent with the results of our preliminary study,21 DIAKIK allowed significantly greater corneal tissue sparing than LASIK, providing support for the notion that this technique should be considered whenever high astigmatism is detected, particularly for grafted corneas, which require as much preservation as possible. The high level of tissue consumption is a limiting factor of LASIK. Alio Del Barrio et al.23 showed that the correction of compound hyperopic astigmatism with a high cylinder by LASIK was safe and moderately effective, but none of their patients had complex astigmatism after keratoplasty. Bilgihan et al.24 found that photorefractive keratectomy to correct myopia and astigmatism after keratoplasty was less effective and less predictable than photorefractive keratectomy for naturally occurring myopia and astigmatism. Other techniques have been described for the correction of high astigmatism. Arcuate keratotomies are effective for improving the mean cylinder and UDVA and CDVA (although not always significantly), but they do not improve the spherical equivalent.11–13 We obtained similar results in our study, after phase 1 (T1). However, severe complications have been reported to occur at rates of 0% to 17% after arcuate keratotomy.11,13,25,26 Moreover, as shown by Böhringer et al.,27 who performed a study with a longer period of follow-up, the effect of surgery decreases by 0.30 diopters per year, which implies that the effects of surgery may eventually disappear altogether, making it necessary to consider new options. However, the development of femtosecond lasers has increased accuracy and made it possible to treat only the deep cornea. 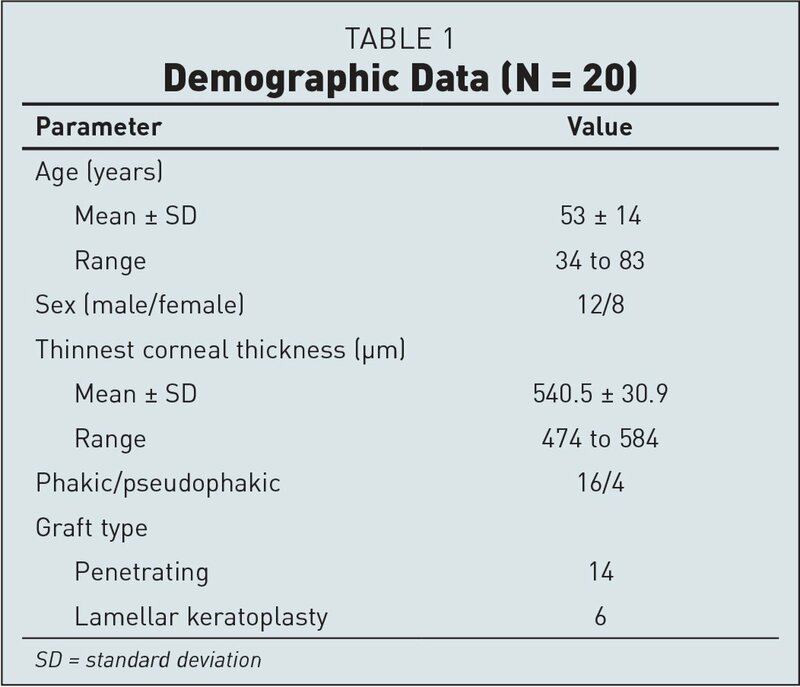 Stromal arcuate keratotomies have fewer complications, but are also less effective12 because they spare the Bowman layer, and their effects are also likely to disappear over time because the same corneal healing mechanism is at work. Thus, this technique may be insufficient if used alone in cases of high irregular astigmatism, but potentially useful if combined with another technique. Intraocular lenses are also effective. Lockington et al.28 showed that cataract surgery with toric intraocular lens implantation in eyes after keratoplasty was safe and effective for significantly reducing corneal astigmatism and improving visual acuity. However, in younger patients with persistent accommodation, phacoemulsification is unsuitable. The patients in our series had a mean age of 53 years, and most would not be eligible for such surgery. Tahzib et al.29 presented the results of a 3-year follow-up analysis of Artisan toric lenses after keratoplasty in phakic and pseudophakic eyes. They considered their results for visual acuity and spherical equivalent to be good, but they encountered problems of irreversible corneal decompensation. Moreover, the implantation of such lenses through a 5.3-mm incision itself induced astigmatism. Toric implantable collamer lenses could also be considered because they have yielded good refractive results in some studies.30,31 However, these studies were performed on patients with smaller cylinders who had not undergone keratoplasty, and this technique is not without risks (glaucoma and induced cataracts). Thus, the combination of a superficial lamellar keratotomy (with a flap), deep intrastromal arcuate keratotomies, and photoablation with an excimer laser appears to be effective. Güell and Vazquez16 also reported promising results with a combination of manual arcuate keratotomies and lamellar keratotomy, with excimer laser treatment as a second step. However, they performed regular arcuate keratotomies, which entail a certain number of risks. Likewise, Shalash et al.22 performed manual keratotomies after forming a flap with a microkeratome. We believe that the use of a femtosecond laser for flap formation and keratotomy increases reproducibility and precision. Our study yielded promising results for this combined technique, but further investigations are required to evaluate its long-term benefits, particularly to ensure that the decline of the effect of stromal arcuate keratomies is not too large. It might be of interest to have a longer interval between the two surgical steps to assess the longer-term effects of the arcuate incisions and check their short-and long-term refractive stability, or to perform a long-term randomized study with a control group undergoing arcuate incisions alone. This would make it easier to evaluate the benefits of DIAKIK over arcuate incisions alone more fully. Astigmatism occurring in grafted patients is likely to be non-orthogonal. In this case, topography-guided photoablation would be an interesting approach. Indeed, regular devices currently have a limited capacity for collecting information from highly irregular surfaces because of light dispersion, diffraction, and aberrations that are too complex for their sensors to read.32 Laíns et al.33 found that topography-guided treatment was a promising technique in irregular astigmatism after corneal transplantation. DIAKIK is an effective technique for treating highly irregular astigmatism. It combines the benefits of incisional surgery, photoablation, and two-step surgery, thereby maximizing the chances of success and its results remain stable after 24 months. Burk LL, Waring GO III, Radjee B, Stulting RD. The effect of selective suture removal on astigmatism following penetrating keratoplasty. Ophthalmic Surg. 1988;19:849–854. Troutman RC. Microsurgical control of corneal astigmatism in cataract and keratoplasty. Trans Am Acad Ophthalmol Otolaryngol. 1973;77:563–572. Alió JL, Javaloy J, Osman AA, Galvis V, Tello A, Haroun HE. Laser in situ keratomileusis to correct post-keratoplasty astigmatism; 1-step versus 2-step procedure. J Cataract Refract Surg. 2004;30:2303–2310. Mrochen M, Krueger RR, Bueeler M, Seiler T. Aberration-sensing and wavefront-guided laser in situ keratomileusis: management of decentered ablation. J Refract Surg. 2002;18:418–429. From Quinze-Vingts National Ophthalmology Hospital (GD-M, OL, IG, VB, LL, NB) and Institut de la Vision (VB, LL, NB), UPMC–Sorbonne Université, Paris, France.